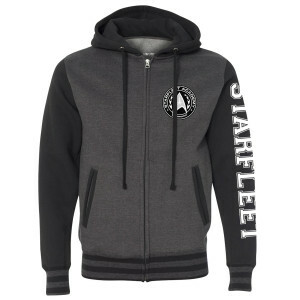 You're one of the top cadets at the Starfleet Academy, and what better way to show some love than in the Star Trek Starfleet Academy Varsity Zip Hoodie. This charcoal grey black full zip hoodie features the Starfleet Academy logo embroidered on the chest, with striped cuffs for some serious varsity style. Throw on the hoodie when it gets chilly at school, no matter what department you're in! I bought the hoodie in XL based on a few reviews below. As stated in previous reviews, XL is a bit big but not big enough that it’s worth returning. The hoodie is so warm, soft, and comfortable that I practically live in it now. I’ve machine washed the hoodie twice now and there has not been any shrinkage nor has any of the screen printing been damaged. Great quality! Worth it!! I love the jacket. Ordered the XL so I could wear it over other clothes easiest but it runs a little large. Not enough to make me go through the return hassle but if I had it to do over would probably settle for the large instead. It's very warm and cozy so definitely a fan still. Soft and comfortable. Note on sizing...these sizes definitely run toward “traditional” sizing parameters. Certainly not trim or slim fit here. Just something to keep in mind. A great sweatshirt in which to lounge around! I love this hoodie, it is very soft and comfortable to wear. And...I discovered hidden pockets inside the hoodie in addition to the ones on the outerside. Those are a bonus. This is going to be my go to hoodie for a while. i have to say, I love this jacket. its soft, comfortable and it fits just right. thank u!!!! it was my first product that j bought from here, and now it wont be my last. Love the hoodie. The varsity sleeve printing sticks together when it first gets opened up but otherwise feels great. It is very warm which is great for Canadian winters. The 3xl fit is a tiny bit smaller than I was expecting but it wears very well. Love the look and design, loved this purchase. This is a wonderful product. It’s well made, fits great, is comfortable and looks good. I even get compliments from my non Trek loving family that they LIKE this purchase. Lolol Buy with confidence! Fits and looks great, this is premium stuff right here! Worth it IMHO. Love it!! Soft inside. Fit perfect. Very happy to be able to share my attendance in starfleet academy ? ?